They were 111 to start this morning in the first TriStar111 of Nevis, like a sign of destiny ...Moments before the race they all gathered to listen to the National Athem Sung acapella by three local singers. the weather was mild, turquoise waters and of about 28 degrees. What else to do other than triathlon in these conditions? In the first line, Macca and Olivier Marceau attract all eyes. Winston Crooke gives the start of the race at 8:15 precise. The first out of the water is the young Canadian Wolfgang Guembel closely followed by Macca. One minute down, Olivier Marceau made ​​his appeareance. On the female side, Emma-Kate Lidbury was the fastest, but the Brazilian Fernanda Keller was not far. The bike leg is the major difficulty of the day with 100km and the famous Mount Anaconda to be do be done three times. In this game, Macca is still the strongest; Olivier Marceau encounters some mechanical problems, and Wolfgang Guembel is eventually unable to follow the acceleration of the world champion. At transition, Macca has more than 10 minutes of lead on Guembel and 14 on Marceau. At this stage, it seems that the race winner is to be announced already! The running course is not easy with small climbs above the village and return by the beach.the sister island of St. Kitts can be seen in the distance and athletes have three times to observe it! Emma-Kate Lidbury will win the race if she manages to keep the pace on the run part. Macca is announced at the finish line and all photograph and journalist are there to capture this magical moment that the entire island has been waiting for so many months. The finish line party will continue with Olivier Marceau and Wolfgang Gamble in 2nd and 3rd places respectively. As expected, Emma Kate Lidbury crosses the finish line first 35 minutes ahead of Fernanda Keller. All day long the crowd is there to congratulate all the finishers, the Prime Minister is also there to hand the medals to the athletes. The last to cross the finish line is 58 year old Paula Price who has never given up and closes the first edition of the TriStar Nevis. Today was a day of history for the small island Nevis. Long live TriStar Nevis. What a day in Nevis! The race was exciting - unfortunately the high temperatures managed to slow down one of our timing computers so much that the live timing was not functional. Please accept our excuse for that. The race photographers are uploading images, so you'll be able to check them out in the PHOTOS tab soon. Many athletes of the TriStar111 race are already out on the bike course. Check out the LIVE TIMING tab for ranks. As usual with TriStar, you can filter the timing information exactly the way you want it. CURRENT RACE RESULTS give you an overview about the leaders. PERSONAL RACE RESULTS give you an overview about all timing information about the athlete of your choice. Enjoy the live timing! Yes, you can! While the 11.1 participants are already in the water, the gun for TriSTar111 will go off in a couple of minutes. At 8:45, 33.3 participants will be sent off for their triathlon. Click on the LIVE TIMING tab to see the rankings for the race. Everything is ready for the big day! The small island of Nevis prepares to celebrate its first TriStar! The weather that usually is calm appears to be accelerated today in Charlestown. The bikes come and go on the main road around the island, the Star&Co Expo Village has athletes pick up the race packages and TriStar Nevis T-shirts are popular souvenirs ... All people know that TriStar is here! A car with a megaphone rolls through the streets of down-town to announce the event: Nevis Capital of Triathlon for a weekend! While some of the competitors are busy with final preparations and picking up their bib, others are already busy to park their bikes in the bike park. The atmosphere rises gently to the sound of lively music, reggae sound loops and Caribbean music, that is the program here in Nevis! The volunteers are in place and show a friendly smile, Pros visiting the Star&Co village... everyone wants a photo with Macca - this man is really an icon! Tomorrow, Olivier will try to be the star! He is determined to give everything in the race and the struggle between the two World Champions promises to be beautiful. Unless the young Canadian Wolfgang Guembel comes to mingle in the debates! Soon the entire Nevis Triathlon family will proceed to Coconuts Beach to see the race briefing and then share a wonderful Energy Party with Gary, the restaurant owner and also official race speaker. 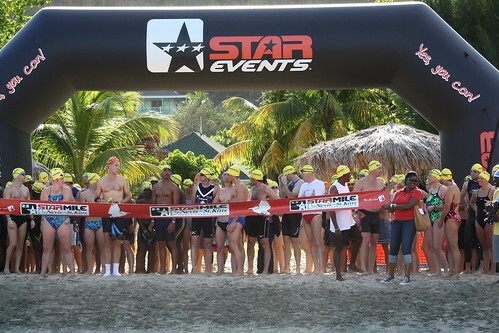 Tomorrow early morning, the athletes will be facing the sea, facing themselves, for a great moment of triathlon in the Caribbean: TriStar Nevis is born! Let the fun begin! At Banana's cafe, a stylish arty and famous restaurant of Nevis, the Nevis TriStar pro athletes were present for a press conference. It was the perfect moment for Chris McCormack and Olivier Marceau to share their impressions about Nevis. For Chris Mc Cormack, the island of Nevis is a hidden pearl in paradise for triathletes. "Everything is great, in Nevis, the people are very friendly and you can go anyplace biking and running in complete safety". Olivier completely agreed with Macca: "This morning I had a flat tire, and the first car that came stopped and brought me back to the hotel. It is not something I am used to, but here it seems to be something very common." Concerning the race, Macca and Olivier said they love their early morning bike ride over the island enjoying the beautiful views and also practicing a challenging and windy course which has a unique flavour to it. They also enjoy the run course, which they find very typical and diversified, as the first part is through a local village and it then finishes with a run on the beach including spectacular views of St Kitts. Macca and Olivier didn't know Nevis before they came here, just as the locals didn't know them either. The two champions and the island of Nevis will never forget this enchanting encounter... As a proverb here in Nevis says: "You are a stranger in Nevis only once." Chris Mc Cormack and Olivier Marceau teamed up for the Pink Lilly run for breast cancer organized by TriStar Nevis, supported by Livestrong™ and sponsored by the Four Seasons Resort Nevis. 150 people followed the call for this fun run walk, 50 of them came from the Four Seasons, guest or staff members were there because they care ! Chris Mc Cormack was very supportive of this event and enjoyed this light run. " This kind of initiative must be encouraged and it's fantastic that Nevis is there to support the research." Olivier Marceau is also a fervent supporter of this initiative and ran with other participants. For a few moments the two champions who normally try to go as fast as possible, took their time for this cause. And one thing is sure : everyone who took part in this initiative was 100% committed to the cause. Franck Buananno , Philippe Bouvet and Edouard Salle are three long time friends. They are French, triathletes, living in FUVEAU (13),BORDEAUX (33) and PARIS (75) and made the bet to return to Nevis for a sporty and exotic week. Sales manager, Marketing employee and Export manager, those three guys have already forgotten all about their daily lives. Here in Nevis, time stops! Last sunday they took part in the StarMile2.5 and crossed the channel separating Saint Kitts from Nevis. They really enjoyed this first major event on the island 6 days before the TriStar. "There was a fantastic atmosphere, people are so nice here... Swimming from one island to another is an unforgettable experience... Getting together suddenly in the middle of the Ocean is a real human adventure!" they said after the race. The next step for our frenchies on Wednesday for the charity race ‘Pink Lily’ in Nevis (5 km race for the fight against breast cancer). In the meantime they are training, getting some good advise from our champions Macca and Olivier, and take rests also because the island is very quiet and yet very wild. They are now looking in the direction of TriStar111 Nevis, and at the same time the three friends have a good time and enjoy all the moments to fill their memory with beautiful images and let their body get rid of stress of European life. Oualie Beach, Nevis. This tuesday the TriStar athlete gathered early in the morning to experience a bike ride with Olivier Marceau and Chris Mc Cormack. Before that, an island clean up was also taking place at Oualie Beach with the support of the Nisbet plantation team. Macca and Olivier said they are very sensible to environmental issues and they deeply support this initiative. "The athlete must be an example," says Macca, "and never throw anything away in an inappropriate place." Olivier added "Anything we can to do encourage good athlete behavior when it s comes to environmental protection must be encouraged and supported". All TriStar athletes enjoyed the ride and they all agree on one thing: the bike course is beautiful and also very hard, especially the anaconda climb at the start of the bike race is very challenging. They all look forward to the start of the race to see how far they can go and test their limits to become a TriStar Nevis finisher. The finishers of the first Star Mile are arriving one by one cheered on by their friends, families and Reggie Douglas. What they have done to get there is huge by anyone standards: a 2.5 mile cross channel swim with strong currents. 112 swimmers were there this morning at Oualie beach ready to show they can! Amongst them: Chris McCormack and Oiivier Marceau, a 10 year old boy Daryl Appleton from Antigua, Barry Wilson 66 year old from Switzerland. They come from all over the world, France, USA, Great Britain, Brazil, Trinidad, Australia, Antigua, South Africa, St Kitts and Nevis... most oft them don't know each other, but they all share the same goal: reaching Reggae beach in St Kitts. At 08:15 Winston Crooke gives the start and one by one the athletes jump in the ocean ready to face the unknown. For those who want to race, it is a quick start, and of course this is the case for Olivier Marceau and Chris Mc Cormack. For others it is simply the challenge of testing their swimming capacities and exceeding what they thought were their limits. 56 minutes later, Olivier Marceau and Chris Mc Cormack are almost head to head fighting for an epic finish. Olivier Marceau will finally be the fastest of the two by only a few meters, and as a symbol of sportsmanship, Olivier waits for Macca so they can both cross the finish line together, showing everyone the true values of sport. As to the 10 year old boy Daryl, he finishes 9th overall for his first open water swim. Barry Wilson also crosses the finish line under the spectator's applause, as each of the 112 heroes did, just to prove themselves: Yes, you can!